Report on demographics & consumerism highlights the challenges to the global economy & the financial markets .. "An economic and financial system premised on perpetual growth was bound to run into trouble .. 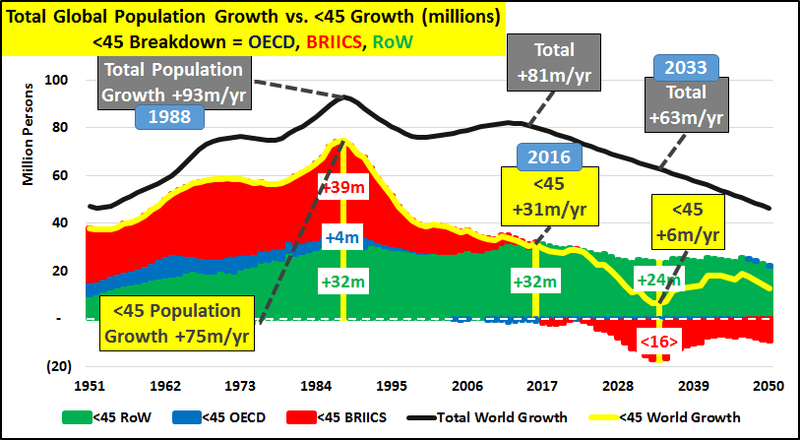 The inevitable deceleration of population growth was the trigger that turned central bankers into pushers offering ever cheaper credit. The lower rates drove unsustainable rates of consumption absent even further rate cuts and likewise drove overcapacity which likewise needed even lower rates. But negative rates of NIRP are simply no longer under the heading of capitalism (a market that doesn't value capital likely isn't capitalism?!?). When we've clearly changed 'ism's'...we've crossed the Rubicon. What happens as population growth turns to population decline is honestly and literally a complete and total game changer. A flat to declining number of buyers and consumers opposite ramping elderly sellers plus their unfunded liabilities is a problem with no happy resolutions. Currencies, 'free-markets', and perhaps the basis of civilization hang in the balance of the transition from high population growth to potential outright depopulation. I believe this is the correct lens through which to view and understand why growth is perpetually weakening, why commodity overcapacity and slowing demand will only accelerate, why the Treasury market continues to see 'buying' despite the near total absence of buyers (Treasury Mystery), why equities are a 'buy' (but for all the wrong reasons), and why precious metal valuations are so extremely suspect in the face of a monetary onslaught."